Celery Root and Asian Pear Waldorf Salad - Our Sunday Cafe, the Retirement Edition! Welcome to Our Sunday Café, we are pleased you stopped by for a visit. Today we are offering another delicious recipe from our kitchen. We hope you enjoy it as much as we did. This is a wonderful salad, perfect alongside any meal. We enjoyed it with grilled chicken, but it would be equally at home during the holidays as part of a larger meal served to family and guests. It can be made ahead and refrigerated for up to an hour before serving to allow those last minute tasks to take place. And your family will love it. I hope you enjoy this as much as we did. 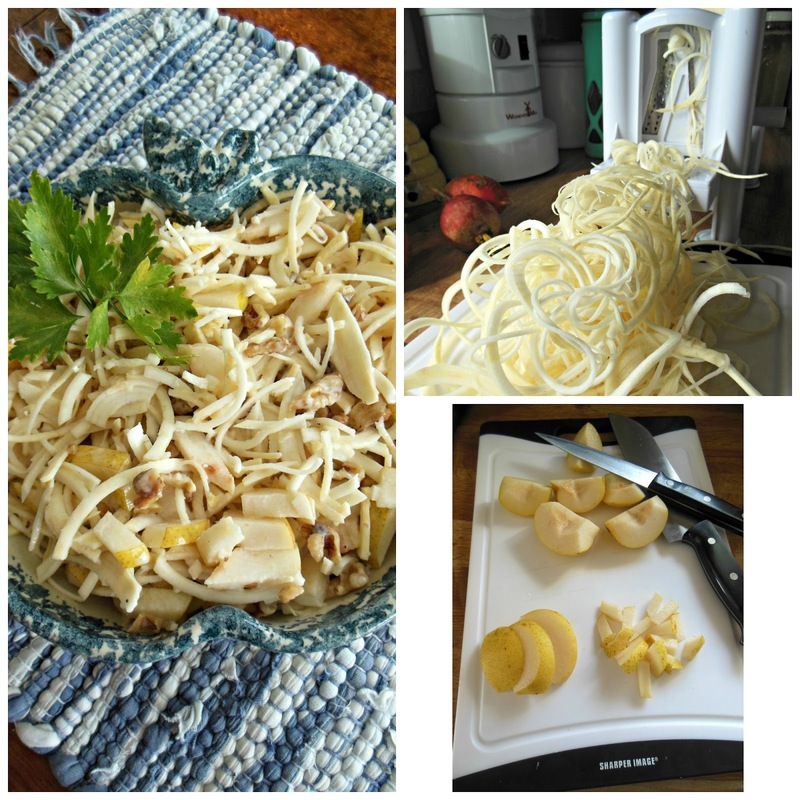 Celery root is one of our favorite vegetables to find creative ways to enjoy. 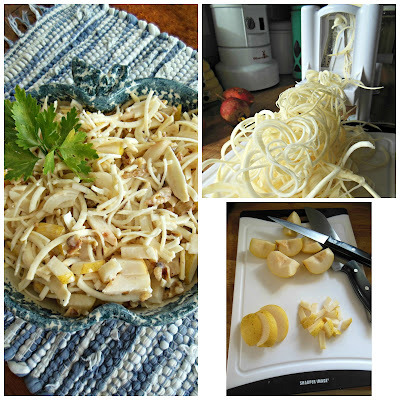 Currently, I am having a fun time making salads with the spiralizer, and this salad was made using that tool, however, a box grater or food processor can be used as well. 1/2 c coarsely chopped walnuts. Shred the celery root, using your preferred method. Cut the Asian Pears into quarters, core, slice then slice in the opposite direction to get nice bite-sized pieces. I like to cut through in each direction a few times to tame the tangle. In a small bowl combine the mayonnaise, maple syrup, and cider vinegar. Mix well until creamy. Set aside. Lightly season the celery root and pears with salt and pepper, Pour the dressing over the root and pears, toss well. Add walnut pieces, toss again. Turn into a serving bowl, cover and refrigerate up to an hour before serving. This sounds crunchy and refreshing. Asian pears were at the farmers market last week, I'll have pick some up. I've never eaten anything like this, but like Beth F said, it sounds refreshing. I love the flavours you have used in this salad, Melynda. There are so many lovely flavour foils and contrasts - I can't wait to give it a try. Thank you for sharing with us at Hearth and Soul. I am going to have to try the celery root, you have inspired me with this salad! Hope you are having a great day and thanks so much for sharing with Full Plate Thursday.